As summer comes to an end and the first day of school is here, I once again ask that age old question — “What the heck to feed my kid?” I love to create fun, healthy lunches that she will devour, but in truth I can not tell you how many times I have dug through her back pack only to find crushed sandwiches and half eaten pieces of fruit that I can no longer recognize. 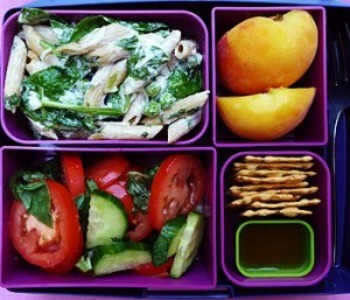 I love the bento box idea with compartments for lots of little snacks, such as nuts, fruit, roll ups — all things that you know your child will eat. You can find these boxes in many Asian stores or from a couple of moms in Santa Cruz who developed the Laptop Lunches. Their slogan is ‘bento-ware for everywhere’. Amazon has a few cute ones, as does the Ultimate Green Store . Once you find the packaging, the challenge is what to put in them. Dinner leftovers and grazing food are always a hit with my daughter, Emma. I have to stay one step ahead of her and really listen because what she loved and gobbled up one day comes back untouched the next. I suspect that this will always be an ongoing area of creative cooking, therefore, I doubt that this will be my last column addressing such issues. I invite you to come on into the trenches with me and make it a good year and good lunches! Flake the tuna and squeeze lemon over it. Combine the tuna, 2 tablespoons mayonnaise, carrots and cucumbers in a small bowl and mix until blended. Lay the tortillas on a work surface. Spread 1/2-teaspoon mayonnaise on each tortilla and arrange the lettuce on top of both and avocado lengthwise in rows near one edge. Spoon the tuna in a line next to the vegetables (away from the edge). Roll each tortilla up snugly into a cylinder. Cut crosswise in half. ½ is more than enough for a small child. A teen or adult could eat two halves. TURKEY REUBEN: Sliced turkey topped with sauerkraut, thousand island dressing and swiss cheese on grilled rye bread. TURKEY BLT: Sliced turkey, bacon, lettuce, tomato and mayonnaise on toast. Whisk vinegar, oil, salt and pepper in a bowl. Coat a baking sheet with cooking spray; place vegetables in 1 layer on sheet. Brush both sides of eggplant and zucchini with vinegar mixture. Spray all vegetables with cooking spray and place under broiler, 7 to 8 minutes, turning once and coating with cooking spray. Lightly brush bottom slices of ciabatta with remaining vinegar mixture. Pile veggies, cheese and basil on 4 slices of bread. Close sandwiches; spray both sides with cooking spray. Heat a medium nonstick skillet over medium-high heat; add sandwiches. Place a second skillet on top of sandwiches and press down. Cook 4 minutes, flipping once. Makes four sandwiches. In a small bowl combine cream cheese and watercress. Spread on one side of each side of bread. Lay cucumbers onto the cream cheese on eight slices of bread. Sprinkle with salt. Top the remaining slice of bread cream cheese side down. Carefully cut the crusts from each sandwich with a sharp knife. Cut the sandwiches in half diagonally and then in half again. Place in blender and puree until smooth and fluffy. Gently toss in a large bowl. Add the dressing and toss until evenly coated. Gently toss in eggs and serve. Cook pasta in large pot of boiling water. Drain the noodles, let stand and use the warm pot to make the sauce. (It helps with the thickness of the peanut butter) Wisk the rest of ingredients until blended. Mix in the pasta. Let stand in the refrigerator for at least four hours. Before serving toss with the garnishes of your choice. Into an extra-large pot of well-salted boiling water add the raviolis. After a few minutes, when a couple of the raviolis begin to float, add the asparagus and peas. Since the asparagus is thin and the peas aren’t frozen, you’ll need to cook them only for about a minute – really quick, just enough to brighten up the peas and give the asparagus a touch of tenderness. Drain everything into a large colander. Immediately transfer to a large bowl, add the spinach and pine nuts, and gently toss with a couple big splashes of olive oil and a pinch or two of salt. Sprinkle with Parmesan! Cook tortellini in large pot of boiling salted water until just tender but still firm to bite. Drain, reserving 1/4 cup cooking water. Combine tortellini, chicken and 1-cup pesto in heavy large skillet over medium heat. Toss until mixture is heated through, adding reserved cooking water and additional pesto by tablespoonfuls until sauce coats pasta. Season to taste with salt and pepper. Transfer to bowl. Pass additional Parmesan. Remember you can change this with any number of variations—toast pine nuts and add them in, maybe try a few chickpeas. Diced red peppers, small black olives, any spicy dark green olive carrots, edamame, chick peas, dried fruits and nuts—anything your picky eater will like! In a medium-sized saucepan, bring water, butter and salt just to moment of boiling. Add couscous and put cover on. Take the pan off the heat. Let it stand for five minutes. Meanwhile, dice your onions and shred your arugula into small bite-size pieces. Cut tomatoes into small pieces and get rid of seeds. When couscous has cooled, put it into your serving bowl. Fluff it with fork, moisten with water or stock if there any lumps. Blend in your onions, arugula and tomatoes. Crumble feta into small pieces into salad. In a small bowl or jar, whisk lemon juice and olive oil together. Grind a little fresh salt and pepper into vinaigrette. Stir into salad. Gwen Kenneally is the owner of Back to the Kitchen, Full Service Catering and Party Planning. She is the co-founder and master baker at Magpie Gourmet Mini Pies. Check out her websites www.Backtothekitchen.netand http://magpieminipie.vpweb.com/Our-Pies.html She wrote a weekly food column for the Sun Community Newspapers.